She has slipped into a colorful Punjabi suit, jewelry, long plait with a parandi and loud make-up. Richa who mesmerized with her performance in critically-acclaimed Masaan last year, seems all-set with a Punjabi avatar for the song in Sarbjit. The actress will be reuniting with her Main Aur Charles co-star Randeep Hooda for the film, she adds, ‘You will see more romance this time around. The earlier film was quite intense. Working with Aishwarya too is pretty amazing." 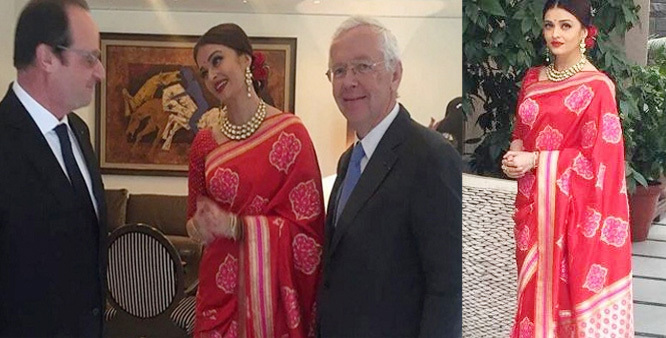 Aishwarya Rai Bachchan took an off from the shoot to meet French President Francois Hollande at a special luncheon in Mumbai. The actress was seen wearing a red Mehraab silk sari designed by Swati and Sunaina. Omung Kumar's Sarbjit biopic starring Richa Chadha, Aishwarya Rai Bachchan and Randeep Hooda will be releasing on May 19, 2016.